Madhya Pradesh represents great river basins and the watershed of a number of rivers. Catchments of many rivers of India lie in Madhya Pradesh. The Narmada (originating from Amarkantak) and Tapti (originating from Multai of Betul District) rivers and their basins divide the state in two, with the northern part draining largely into the Ganga basin and the southern part into the Godavari and Mahanadi systems. The Vindhyas form the southern boundary of the Ganga basin, with the western part of the Ganga basin draining into the Yamuna and the eastern part directly into the Ganga itself. All the rivers, which drain into the Ganga, flow from south to north, with the Chambal, Sipra, Kali Sind, Parbati, Kuno, Sind, Betwa, Dhasan and Ken rivers being the main tributaries of the Yamuna. The land drained by these rivers is agriculturally rich, with the natural vegetation largely consisting of grass and dry deciduous forest types, largely thorny. The eastern part of the Ganga basin consists of the Son, the Tons and the Rihand Rivers, with the Son being the major tributary. This is also the junction point of the Satpura and the Vindhya ranges, with the Maikal and Kaimur Hills being the fulcrum. The forests here are much richer than the thorn forests of the northwestern part of Madhya Pradesh. The Son is of great significance in that it is the largest tributary going into the Ganga on the south bank and arising out of the hills of Madhya Pradesh rather than from the Himalayas. This river and its tributaries contribute the bulk of the monsoon flow into Ganga, because the north bank tributaries are all snow fed.The major tributary of the Ganga, the Son, arises in one of the most important watersheds in India, the Maikal hills around Amarkantak. Three of the great rivers of India, Narmada, Mahanadi and Son, are given birth to by these hills. This is also one of the few ranges in the State having a north south configuration. The Mahanadi itself, together with its tributaries such as Hasdeo, Mand and Kharun flows southeast into Orissa and converts that State into a green rice bowl. The upper Mahanadi catchment contains some of the finest forests in the State, ranging from mixed deciduous to teak, bamboo and Sal. Just as the Mahanadi flows east from the Maikal hills and the Son flows north, the mighty Narmada charts a westerly course from these very hills. The Narmada flows through a rift valley, with the Vindhyas marching along its northern bank and the Satpuras along the southern. Its tributaries include the Banjar, the Tawa, the Machna, the Denwa and the Sonbhardra rivers. Taken in combination with its parallel sister river, the Tapti, which also flows through a rift valley, the Narmada - Tapti systems carry and enormous volume of water and provide drainage for almost a quarter of the land area of Madhya Pradesh.The Satpuras, in the Gawilgarh and Mahadeo Hills, also contain a watershed, which is south facing. The Indrawati, the Wainganga, the Wardha, the Pench, the Kanhan and Penganga rivers, discharge an enormous volume of water into the Godavari system. The Godavari is the lifeline of Andhra Pradesh, but the water which feeds it is a gift of the Central Indiawatershed. Some of the finest sub-tropical, semi moist forests in India are to be found in the Godavari basin, mainly in the valley of the Indrawati. There are very few virgin forests left in the country, but very fine examples of these are to be found in Bastar area along the Indrawati and in the Kanger valley in Chhattisgarh. River Chambal originates from Indore district and meets river Yamuna near Bhind. Total catchments area of Chambal in Madhya Pradesh is 59940 km². Total length of the river 938 km, out of which initial length of 320 km lies in Madhya Pradesh, 226 km in Rajasthan, 216 km makes the boundary between Madhya Pradesh and Rajasthan, 112 km makes the boundary between Madhya Pradesh and Uttar Pradesh and 64 km in Uttar Pradesh before confluence with Yamuna river. Kali Sindh, Parvati, Kuno and Sip are the main tributaries of the river Chambal. River Sindh originates in Vidisha district. Total catchments area of the river in Madhya Pradesh is 26699 km² and total length is 470 km. A length of 461 km of the river falls in Madhya Pradesh and 9 km in Uttar Pradesh. Major tributaries of Sindh are Mahuar, Parbati, Pahuj, and Kunwari. SUB-SUB BASIN River Jamni originates in Sagar district. Total catchment area in Madhya Pradesh is 1235 km² and total length is 201 km. In Madhya Pradesh the river flows for 29 km, for 85 km river makes boundary between Madhya Pradesh and Uttar Pradesh and last 87 km flows in Uttar Pradesh. SUB-SUB BASIN This Dhasan river originates in Raisen district of Madhya Pradesh. Total basin area in Madhya Pradesh is 8291 km². Total length of the river is 365 km, out of which 240 km lies in Madhya Pradesh, 54 km common boundary between Madhya Pradesh and Uttar Pradesh and 71 km in Uttar Pradesh. River Ken originates in Jabalpur district. Total basin area in Madhya Pradesh is 24785 km². Total length of river is 427 km, out of which 292 in Madhya Pradesh, 84 km in Uttar Pradesh and 51 km makes the common Boundary between the two states. Total basin area of river Paisuni in Madhya Pradesh is 416 km² and of Baidhan river is 1504 km² in Madhya Pradesh. These two rivers originate in Satna and Panna District and meet river Yamuna below Banda district. Tons originates in Satna district. Total basin area in Madhya Pradesh is 11974 km². The river meets Ganga after flowing 246 km in Madhya Pradesh, 7 km making boundary between Madhya Pradesh and Uttar Pradesh and finally 67 km in Uttar Pradesh. Totoa land put to use for agriculture purpose in Tons basin is 8460 km² in the State for which 2244 hm of water is available for its use against total available water at 75% dependability is 2244 hm. SONE SUB BASIN Total basin area of this river in Madhya Pradesh is 28880 km². Total length of river is 784 km. In Madhya Pradesh, the river flows for 470 km. The river meets Ganga in Bihar state near Patna. The major tributaries of river Sone are Johilla, Mahanadi, Gopad, Rehar, Kanhar, and Banas. NARMADA BASIN River Narmada originates from Amarkantak and flows from east to west and joins ArabianSea. Total drainage area of the river is 98796 km², out of which 85149 km² lies in Madhya Pradesh after formation of Chhattisgarh, which has 710 km². Total length or river is 1312 km and in Madhya Pradesh the river flows for a length of 1077 km. Major tributaries of the river Narmada are Banjar, Heran, Kolar, Sukta, Tawa, Tendoni, Beda, Sher, Shakkar, Mān, Jobatand Goi, rivers. GODAVARI BASIN In Madhya Pradesh, only the river Wainganga, Wardha and Pench originate in district Seoniand Chhindwara respectively. Total drainage area of these rivers on Madhya Pradesh is 23388 km². TAPTI BASIN River Tapti originates from Multai in Betul district. This river also flows form east to west. Total basin area of Tapi is 65145 km². Out of which Madhya Pradesh has 9800 km². Total length of the river is 724 km. In Madhya Pradesh the length of river is 332 km. Total agriculture land available in the state is 6330 km². Water available at 75% dependability in the state is 2401 hm. MAHI BASIN River Mahi originates in Dhar district and joins Gulf of Khambat. Total drainage area of this basin is 34842 km² out of which only 6700 km² lies in Madhya Pradesh. Total length of the river is 583 km of which 158 km traverses in Madhya Pradesh. An as is the major tributary of Mahi in the State. Total agriculture land available in the basin in the state is 3450 km², total water availability at 75% dependability is 1952 hm. MAHANADI BASIN After the formation of Chhattisgarh State, the major portion of Mahanadi basin now lies in Chhattisgarh. Presently, only 154 km² basin area of Hasdeo River in district Anuppur lies in Madhya Pradesh. CATCHMENT AREAS OF MADHYA PRADESH The water resources specific for given time and place in MP during the months of June-September. Rest of the months are dry with negligible rain and relatively high temperature between 35O to 45O in summers. The approximately evaporation losses on exposed and unexposed water bodies can account for 50% of the total rain received in the area. The total quantity of surface and ground water is distributed in different catchments areas of MP as under. Chambal – Betwa – Ken catchment (Watershed of Yamuna) : Khargone, northern part of Jhabua, Dhar, Ujjain, northern part of Indore, Shajapur, northern Dewas, Sehore, Bhopal, Raigarh, Vidisha, northern Raisen, Guna, Shivpuri, Morena, Gwalior, Bhind, Datia, Tikamgarh, Chhatarpur, Damoh and western part of Panna. Son catchment :- Satna, Rewa, southern, Panna, Sidhi, western Jabalpur, Shahdol, north-east Jabalpur, north-east Mandla and northern sarguja. Mahandadi catchment : Raipur, Durg, Bilaspur, Raigarh, northern Bastar and sourthern Sarguja. Narmada catchment :- Southern Jhabua, Dhar, Khargone, Southern part of Indore, south Dewas, south Bhopal, South of Raisen, Hoshangabad, northern part of Betul, Chhindwara, Narsimhpur, southern Jabalpur, northern part of Seoni, Mandla, north Balaghat, south –west Shahdol. Banganga & Pench catchment :- Southern part of Chhindwara, southern east Betul, South Seoni and southern part of Balaghat. Nearly 60% of the surface water can be retained for different uses thus there are a scope for almost more than double the irrigation capacity by building small dams in different streams. It is also seen that, the eastern and south-eastern part of MP has more runoff because of relatively higher rainfall, high gradient and occurrence of crystalline rocks in the major portion of the area. The central part receives lesser rains and therefore proportionate decrease in runoff water and cropping patterns. Western part of MP receive’s much less rain and hence the relatively runoff is less. Most of the streams are almost dry for 4 to 6 months in the year (Jan to June). It is essential that this runoff water should be harnessed by putting a series of small and medium dams on small and big streams. This will not only provide sufficient water on the surface for different uses but also the percolation into the ground. It will increase the level of the ground water to a great extent. The term watershed refers to the geographic boundaries of a particular water body, its ecosystem and the land that drains to it. A watershed also includes groundwater aquifers that discharge to and receive discharge from streams, wetlands, ponds, and lakes. Large watersheds are sometimes referred to as river basins. A watershed could be described as fan shaped (near circular) or fen shaped (elongated). Hydrologically the shape of the watershed is important because it controls the time taken for the runoff to concentrate at the outlet. Watersheds may also be categorized as hill or flat watersheds, humid or arid watersheds, red soil watershed or black soil watershed based on criteria like soil, slope, climate etc. 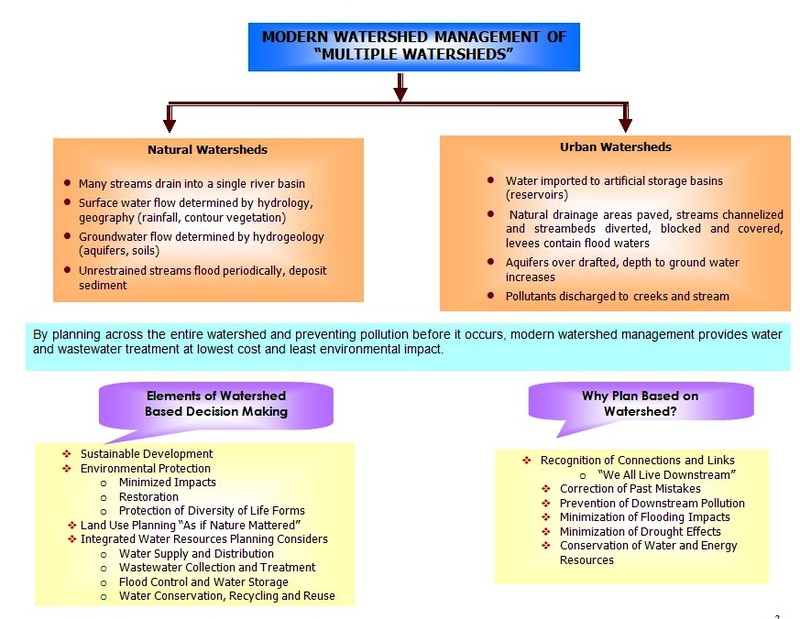 Depending on the land use pattern watershed could again be classified as highland watersheds, tribal settlements and watersheds in areas of settled cultivation.